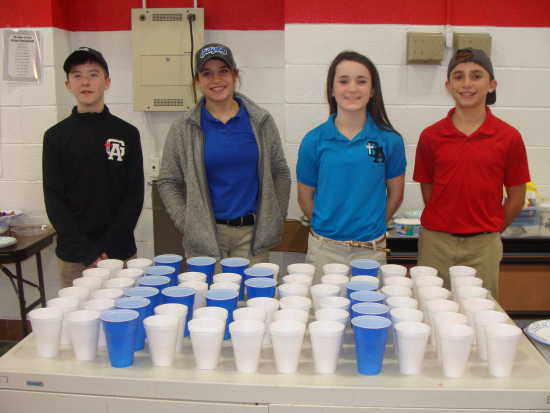 Lawson Hahn, Dalaini Bryant, Taylor Hobbs, and Riley Schlosser pose behind the drink cups that they assembled to show the word "Pi". Pi (pie) Day was celebrated at Guardian Angel School on Thursday, March 14 (3.14). This annual event is put together by Ms. Ann Whistler and her Algebra class. If you walk into her classroom, you will see the number 3.14159 etc. etc. wrapping around the room. One number is put up each day and could continue on and on into infinity. 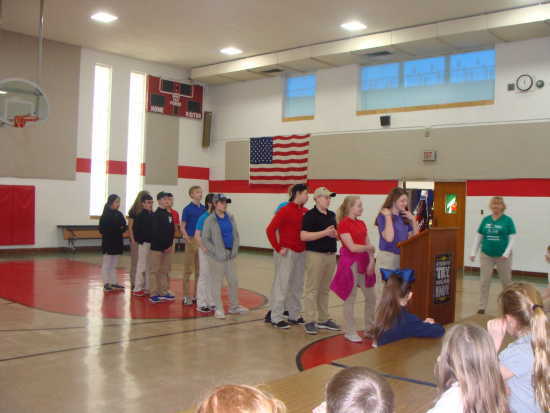 At the Pi Day celebration, each of the Algebra students recite a fun fact about pi. Then, everyone in school gets to eat pie. Several pies were brought in by students and staff. Everyone enjoys this celebration and leaves with a contented stomach. Courtney Dirnberger tells the students a fun fact about pi. Behind her from left to right are Sophie Priggel, Daley Siebert, Owen Forehand, Lawson Hahn, Riley Schlosser, Kyle Eftink, Taylor Hobbs, Dalaini Bryant, Haley Webb, Connor Watkins, Nathaniel Woods, and Logan Dame. Ms. Ann Whistler, to the right, coordinated this event.